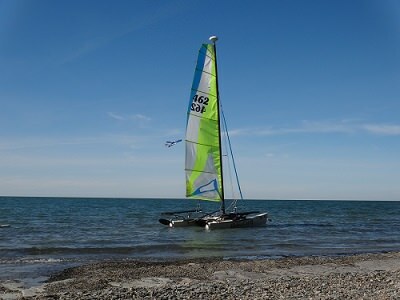 Hobie Forums • View topic - Sail Upgrades? Talking to chip, it sounds like the laminate is a big improvement over dacron in that it doesn't stretch when hit by a gust or puff, so your sail holds its shape better and you get more lift out of the sail. The square top I understand provides an improved aspect ratio of the sail, thereby cutting down on the drag from the tip vortex/lift-induced drag. The advantage in a tri-radial cut I believe is mostly that the sailmaker can more effectively control sail shape and improve longevity, with seams oriented in such a way that they don't see quite as much load as the typical "panelled" Hobie sail. For those who have upgraded their sails, is there a noticeable improvement in power, handling, pointing ability and boat speed with a square topped main? Is there a noticeable improvement still with laminate over dacron? Does the cut of the sail or sail material make a noticeable difference in performance or longevity of the sail? Post subject: Re: Sail Upgrades? while I haven't purchased any custom sails for my H18, I have quite a lot of experience with new sails on other one design boats. 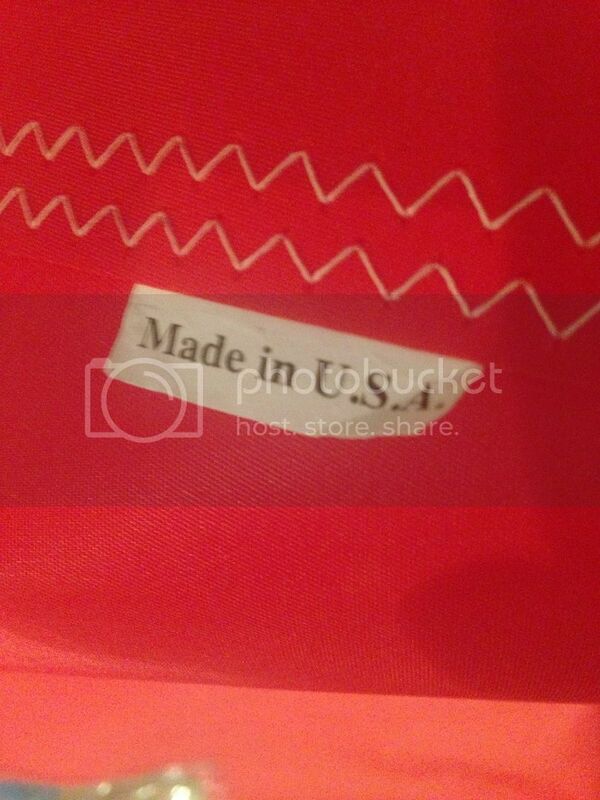 most if not all high performance sails today are of a laminate construction. North, Ullman and others all use it. In all cases it's the thread cord weave between the scrims that provide sail strength, the laminates hold them in place and make them non-porous. The sails are made molded to shape, for specific wind ranges. you mention a tri-radial jib. nearly all modern sails have the thread cord oriented along stress lines: tack, clew and head, with additional reinforcing bands radiating from those points. I can also tell you modern laminate sails require a great deal of care in use and stowing. flogging a sail is damaging. rolling the sail and not creasing it by flaking is important. the scrims wear much quicker than the thread structure and will start to break apart with misuse. I'm sure you already realize that any custom sail limits your racing to open classes, not Hobie one design. Thanks Chris, good information. I know a fair amount about hull design and all, but I'm not overly familiar with sail design, so your input is very helpful. Makes sense, I had thought that laminated sails required more care. I'm not really decided on anything at this point, just exploring options. I started off looking to replace my blown-out jib, but if I decided to upgrade the main later, I'd better figure out what my plans are before buying a jib. At ~$1.5-2k for a new set of sails, I figured it's worth looking at all the options. The sails would probably outlast the boat at this point, so I need to figure out what it's worth to me before I jump on anything. Feels like a bit of a waste though to spend all that money on an outdated sail design. If the H18 fleet was more active and widespread, I might see more benefit in it, but it seems that aside from pockets on the east and west coast and florida, the H18 racing fleet is gone. If I did go aftermarket, I could always hang on to my current sails for the one or two times a year I would get a chance to race one-design, but I'm not sure that's quite enough of a reason to stick with Hobie sails if I buy a new set. 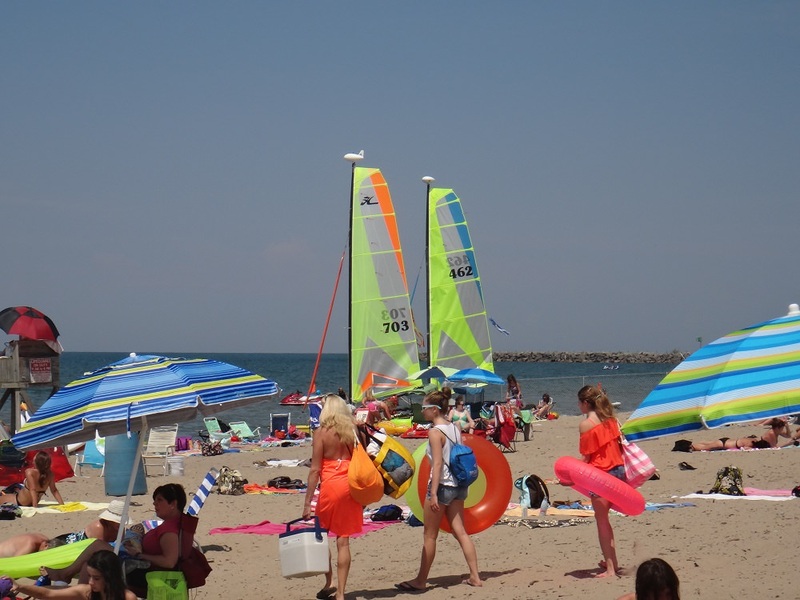 Chip's sails are of a competitive quality and price, of more modern design, and better colors (Hobie's latest sail designs leave much to be desired). But I'm still trying to work out how much of an improvement it is... maybe it's not worth the price, if it's only a marginal improvement. Still, I'm tempted by the square top sail, either panel-cut dacron or tri-radial dacron. I'm not sold on how much of a benefit there is going to a laminate, for the added price. I have also spent way too much on sails for various boats. 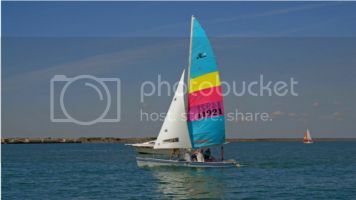 I do not think the Hobie 18 is a boat design that lends itself to much improvement performance wise with new or fancy sails. As an example I point to the Hobie 18SX. It has a taller mast resulting in taller jib and taller main. (Basically the F18 rig and sails). Under portsmouth there is a 1/10th difference in the stock Hobie 18 and 18SX even with the spinnaker included on the SX. While this makes very little sense, it also means no real noticeable speed was accomplished by the taller mast. My guess is you will not see much with fancy sails either. My plastic pentex/kevlar/carbon sails tend to die on the vine about 5 years after receiving them versus my 30+ year old Hobie sails, which still seem very serviceable. I would just go with the standard Hobie sails as it will also be difficult get any extra money for the boat should you try to sell it. Kaos, I decided to take a picture of my current H18 sail and a picture of the square topped H18 sail and draw up the two for a comparison point. The square topped sail is 154 sq ft to the classic sail's 151 sq ft. The classic sail has an aspect ratio of roughly 4.42, and the square topped sail has an aspect ratio of roughly 4.5. Throwing some numbers together, in theory the square topped sail on an H18 in 30mph apparent wind is going to generate up to about 8 pounds more lift, which is an improvement of about 2%, at the expense of a half a pound more drag - but nearly all of the difference is due to the slightly larger sail area and leech length. If those are kept the same, the square topped sail's better aspect ratio accounts for a 1% reduction in drag on the mainsail and 0.2% increase in lift - less than a pound force for each. So in essence, it seems you're right, a square topped sail really doesn't do much of anything to improve the H18's performance, especially not enough to justify the additional cost imo. Conversely, the daggerboards have a very low effective aspect ratio of 2.9, while the F18's have daggerboards with effective aspect ratios of about 15.0 (calculated for the Nacra Infusion MkII image I was able to find). Higher aspect ratio daggers would be a much more significant improvement to the H18, providing better lift with considerably less drag (water drag is far and away the larger factor in boat performance) and allowing the boat to point higher upwind and provide the same lift on the daggers without nearly as much drag. But of course that's far more complex of a retrofit, and not nearly as simple as swapping sails. However, I'm still curious to hear from anyone who may have put on a square topped sail, whether they've noticed any practical/real world improvement. I don't always trust the numbers 100%, and I'm still tempted to believe that the square top provides more of an advantage than what I've approximated... why else would sailmakers have bothered to change the sail designs in the first place? Is the H18 community very particular about the "Hobie only" rule for sails? I see Hobie's price has gone up considerably since I last checked, and I'd much rather spend that extra money on mainsheet blocks, a sail bag, boat cover, new rigging, club membership, race entry fees, replacement wheels for my cattrax, etc, etc. Still don't see much advantage in buying Hobie, they've already discontinued the boat and seem to be jacking up prices for parts. I'm not technically race legal anyway, since I have an original mast and won't be spending the money to replace or convert it. Regarding issues of other Hobie 18's. I do not think you will get any grief from the other sailors. You may run into issues regarding class legal from folks who might be trying to run a Hobie Class legal event. In our area we let a Hobie SX race in "class" with us. Here is the interesting thing I have learned from trying to power up boats with sails. I have one cat an RC27 with square top sail. I have Hobie 33 that I put a mast head asymmetrical sail with a 10 foot bow pole out the front. In all cases, the boat design seems to take precedent over sails(dagger boards you mentioned, etc). Where sails seem to make any difference is if the boat is not to full hull speed. So in lighter air, if your vessel is not yet at hull speed, then more sail area can be helpful. Square top etc, are most effective once you bear off a little, not so much pointing into the wind. Light air is the small exception. Once there is enough wind for a stock boat to get up to hull speed, all the other issues of more sail area etc. becomes moot. The larger sail area is more drag and must be managed more, etc. Basically if the boat is at full speed, more sail area will not make it faster. On the Hobie 18, the most effective increase of speed that I noticed was when I added a spinnaker to it. Off wind it had way more life to it than I expected. If I was to spend any extra money, it would be on a spinnaker. I'm unpacking a Whirlwind square top laminate with dacron jib today and will be sailing it all summer at Evangola State Park. I'll be glad to show it off if you want to hook up. Lots of good discussions about this on the CatSailor forums. Personally I've bought a pin top radial cut dacron main from Chip @ Whirlwind for my old H17 and absolutely loved it. Hard to know if there was any difference in performance as my old H17 mylar sail was really blown out. In staying that the dacron radial cut sail was very nice and i liked the dacron knowing I would get many more years out of it compared to newer laminate types. Something I found hard to decide between was the square top vrs the pin top. Other than seeing photos of H17/18's with square tops that just look plain wrong imo, I did note alot of technical discussion about this and decided to stay with the pin top. In short many of the square top designs seen nowadays are said to work with stick masts that don't bend and often high ratio blocks. This enables you to have a tight teech without the square top twisting off and loosing power in a blow. I think inevitability if you setup your H18 correctly (tight diamond wires, slightly higher ratio blocks (not essential) and good mast control) you can gain alittle more power having that extra sail area higher up but likely not a huge difference compared to a genuine H18 main. Very interesting stuff, I appreciate all the thoughts and discussion. Matt, I think you're right, the difference between square top and pinhead is probably somewhat minor, and given the longevity of dacron sails and the cost difference, the classic main is more in line with what I'm looking for. That said, wattfarm I'll definitely have to swing by and check it out, can't pass up an opportunity to see a new set of sails! Your boat looks like it's in great shape, too! There will be a pretty big improvement just having a new sail to begin with, regardless of design. If you look at the US multihull championship last year with the H18s, based on sail number, the one guy that didn't have a new sail finished dead last. Even with second to last having 3 DNFs on the score sheet. Read into it what you will. Maybe he was a casual guy that just showed up to a higher level race with what he had and even with a new sail would have placed the same. Or realistically when competition is tight, having slightly slower equipment can be an insurmountable obstacle to overcome. Regardless, you are in a lose lose situation with an upgraded sail. If you win against people with standard stuff they are just going to say you won because you had better equipment, and if you lose it's going to be embarrassing and feel like a waste of money(and it probably is anyway on a boat barely worth more than the trailer). I'd go with a new dacron personally if I had to. At least if you do well it's theoretically the same shape. At some point the lifespan is just up but unless you are racing against people with new stuff you might just stick with what you have until it explodes. Then you can make some cool gear bags with the old material. Just noticed that Murray's sports also makes sails for a similar price as Chip,, with a few colors more. I figure it's definitely worth looking into, but does anyone have any experience with their sails? Apparently they're made by Hyde sails based on the U.K. Found a rumor on the beach cats that Chip had actually taken a job with them at one point, though it seems he's still running whirlwind. Also saw a rumor that Hyde had done work making sails for both Hobie and the America's Cup, though my understanding was that Hobie sails are made in Mexico. Any thoughts?
. . . though my understanding was that Hobie sails are made in Mexico. Any thoughts? Hobie Cat makes their sails in the USA in the Oceanside, CA factory. In 2009 Chip at Whirlwind convinced me to replace my tired mylar SX main with a Pentex square head. In my first season of racing that year and the first two regattas I came in a solid last using the old sails. The 18 fleet allowed me to use the Pentex sail in my third race and I went from worst to first, and that was the last time they let me race with a Pentex squarehead. I converted the boat to a Standard 18 and got new Hobie sails and have been a solid mid-pack racer. I won't speak to the durability of the Pentex sail since I have used it only thrice since then, but it looks good since sailing it two months ago. I had 37 days of sailing this summer with the new Whirlwind laminate super R square top. On a scale of 1-10 my boat's performance improved 2 notches. I'm on the trapeze at winds around 9 mph( I weigh 190lbs) . That's a bid deal on Lake Erie where white caps and big waves begin forming at 10mph. The only draw back I see is color fading which can be seen on the boat next to me in this picture. His sail is 1 year older then mine.